Last night people in several french cities took the streets again to protest against police violence and justice for Theo. Clashes were reported from Barbes, Rouen, Argenteuil and Menilmontant. It was the 13th night in a row that people protested against police violence in France. Theo was beaten and raped by cops in Aulnay Sous Bois on the second of February. There are calls for new demonstrations today. We publish an overview of protests that are announced for today and the coming days. Image: Rouen, France last night. Althoug the french police has extra powers as France is still under a state of emergency, the state is not able to silence people who are protesting against police violence. Last night was the 13th night of revolt in France, and there is no end in sight. We published several reports about the ongoing uprising. 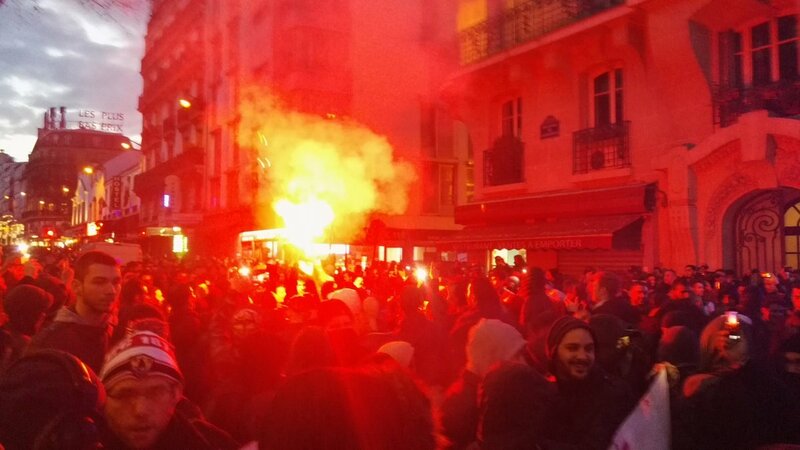 Image gallery: Protests and clashes in Barbes last night. After major clashes in Aulnay Sous Bois, Bobigny and other cities, yesterday people took the street in Rouen, Lille, Saint Étienne, Toulouse and Barbes. In Argenteuil, Fontenay Sous Bois and in Menilmontant there were spontanious actions. The biggest demonstration took place in Barbes. Cops attacked the demonstration with tear gas. Earlier cops blocked the demo in Barbes. France seems to be a country that have made the denial of racism a national sport, the police internal investigation naturally concluded that Theo’s injuries were the result of an accident. This should surprise no one. It was only a few years ago that Hollande, then candidate to the presidency, pledged to remove the word race from the French constitution so that we could, once and for all, get to grips with France’s post-racial era and presumably; live happily ever after. Currently contesting Hollande’s denial score, is the man who could well become France’s next president: Francois Fillon, who shamelessly described colonialism as France ‘sharing its culture’ last summer. The fascist Front National is also playing a key role in France and managed to shift debates in an even more racist narrative. The ongoing protests and actions are carried out by antifa activists (video below) and youths from the suburbs, the so-called banlieues. Authorities don’t get a grip on the protests after the brutal attack against Theo. Police violence is not an incident in France (and other countries). Just one month ago, a friend of Theo, Mohamed, was beaten by the same cop who raped theo with his baton. Under the state of emergency racial profiling operations and police violence have increased fuelling the anger which have led to the ongoing revolt. High unemployment and the betrayal of “traditional” unions against protesters against the neo-liberal labour “Khomri” law are other issues that is constantly fuelling the conflict. People have had enough of police violence and neo-liberal policies. Activists are calling for more protests today in Lyon, Rouen, Boulogne-Sur-Mer, Tours, Crest and Clermont-Ferrand. In the coming days protests will continue. Tomorrow a 3 day long program of ZAD NDDL activists starts in La Wadine. Protests are also announced in Brussels (Belgium), London (UK), Rouen, Nantes, Marseille and Lyon. On Saturday protests are announced in Poitiers, Istres, Brussels (Belgium), Caen, Grenoble, Perpignan, Montepellier, Clemond-Ferrand, Amiens, Rennes, Angers, Mans, Paris, La Rochelle. You will find more announcements on Nantes Indymedia. In Berlin there will be a demonstration against the European Police Congress on February 18. Motto of the demonstration in Berlin is “smart ressistance”. Note: Enough is Enough is not organizing any of these events, we are publishing them for people across the US and Europe to be able to see what is going on. Fourth Night of Protests in Paris After Cops Killed 56 Year Old on Sunday | Enough is Enough! #France Video: Cop Pulled A Gun Against Protesters in #Rennes | Enough is Enough! #GiletsJaunes: Report, photos and videos of #ActeX in #Rouen – Enough is Enough!